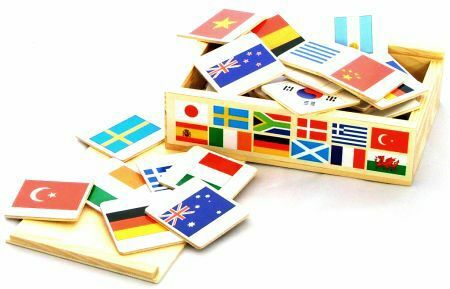 World Flag Wooden Memory Game is a fun, educational toy which tests the memory whilst teaching the flags of many countries. This game comes with 48 wooden squares. The squares have 24 pairs of different flags, in gloss wipe clean paper, attached to them. You place all the pieces face down, then take turns flipping them over 2 by 2 trying to match them up. The trick is to remember where you saw each flag and remember where each flags partner is placed. The set comes in a wooden sliding lid box with a colour insert naming each countries flag. So, as you collect your pairs, you can learn the countries name. Size: The Box is 19cm x 13cm x 5cm The flags 5.5cm x 5.5cm. We like this because: "very simple game, great educational toy. I realised how many flags I didn't know."